Want to avail sale tickets for the fascinating vacation destinations: Batanes, Boracay, Coron or Siargao? Then, visit Skyjet booth during the 6th TME Travel Expo 2017 which will be happening from July 7-9, 2017. Venue for the event is SMX CONVENTION CENTER in SM Mall of Asia, Pasay City. Grabs sale tickets for your next vacation to either of the 4 popular destinations. Travel dates for this seat sale starts July 15, 2017 to June 30, 2018. Do not miss the opportunity to grab the low fares, sale ticket prices are so tempting. However, like other promos, slots for sale flights are limited, so come early to the event and purchase tickets for your choice destination. 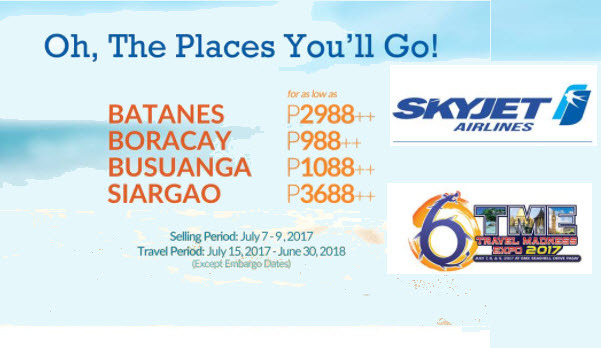 Quoted Skyjet promo fares are good for one-way travel and are EXCLUSIVELY offered at the Skyjet Ticket Booth, Hall 4, SMX Convention Center during the 6th TME Travel Madness Event from July 7-9, 2017. As for July 9, 2017, the travel sale is from 9AM to 6PM. Inclusion in the vacation packages are roundtrip airfare, accommodation for 2 nights, daily breakfast and taxes and fees. So, for travelers who would like to have a grand vacation in any of the above popular destinations, visit the TME Travel Madness Expo 2017 and seize the Skyjet promo tickets or the Skyjet Vacation Packages! For more Skyjet sale tickets and other airline promo fares, LIKE us in Facebook: PISO FARE TICKET!! !